The tight profile is met with tight vibration emitted by Realis Vibration duo(62 & 68). 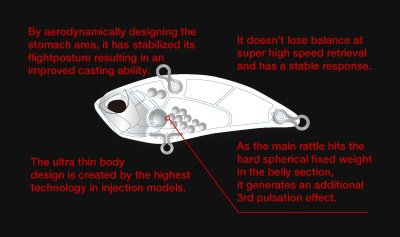 It`s no mistake, this is one of the thinnest lipless crankbait ever constructed. Its precision aerodynamics delivers un-imaginable shedding of lure drag, allowing the lure to cut through water in unprecedented speed and balance. It has been proven bass relate to various retrieval speeds. Lures designed to move through water columns with little resistance can be retrieved at speeds not experienced by many predator fish. Where innovation and engineering meet is considered the balancing fulcrum point of the lure’s purposeful horizontal positioned. Its fall is balanced with a subtle “shimmy”. On the retrieve, the lure has a deliberate and true path. It won’t foul or behave unscripted. Realis Vibration 68 and 62 are predictable and easy to control or impart variance in action. Also predictable, is the durability of DUO’s multi-layer painting. DUO’s prides itself on high quality and labor-intensive painting process, employed, not only to provide a beautiful skin to add durability to the lure.